HomeblogTombstone Tuesday – Edward Bell Conwell, Jr. Welcome to another edition of Tombstone Tuesday! Today we’re not straying very far from last week’s tombstone. It belongs to my maternal grandfather, Edward Bell Conwell, Jr. Edward was the second of eight children of Edward Bell Conwell, Sr. and Zella May (McCabe) Conwell. He had five brothers (one older, four younger) and two sisters (one older, one younger). 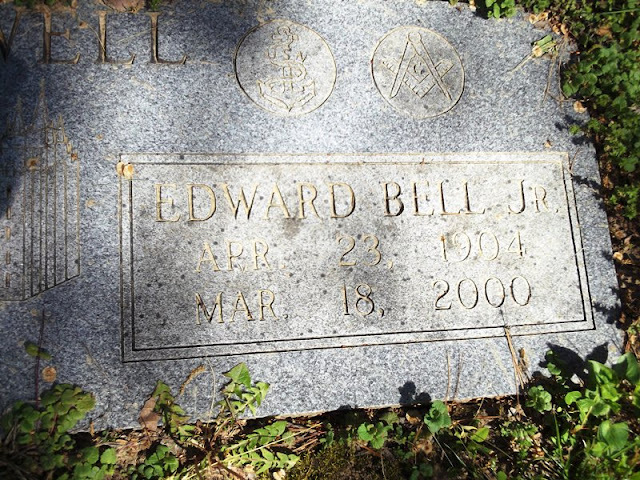 Edward was born 23 April 1904 in Kansas City, Jackson, Missouri and died 18 March 2000 in Atlantic, Cass, Iowa. He is buried in between his first wife, Ada Jane (Correll) Conwell, and his second wife, Edith Marie (Brown) Conwell (my grandmother) in Mount Washington Cemetery in Independence, Jackson, Missouri. He was a fifty year member of the Masons (A.F. & A.M.) and served in the U.S. Navy for a period of time, receiving a medical discharge for stomach issues. I tried to contact you via the contact form below, but it does not apper to be working.